Yay, it’s taco Tuesday! A fact that I only remembered this morning while browsing my Instagram feed, and while it caused me to wonder why someone was eating (and ‘gramming) a ground beef taco at 9 AM, it reminded me that I could use this alliteration-based recurring holiday to share with you one of my new favorite foods: TortillaLand Uncooked Tortillas. This simple product from Circle Foods out of San Diego, CA is the ultimate in taco-delivery systems. They’re easy to cook, much more flavorful than normal store-bought tortillas, and add a special – made by an abuelita – flavor to your dinner. These little babies are so flaky and delicious that you’ll never go back to the pre-cooked kind. Though they’re supposed to be cooked in a skillet, I just throw ’em on the grill as whatever else I’m grilling is at the one-minute mark. Try them. You won’t be sorry. The following recipe is an easy combination of sweet, spicy and savory that uses similar flavors in each element of the dish to create a cohesive whole. It’s really good. 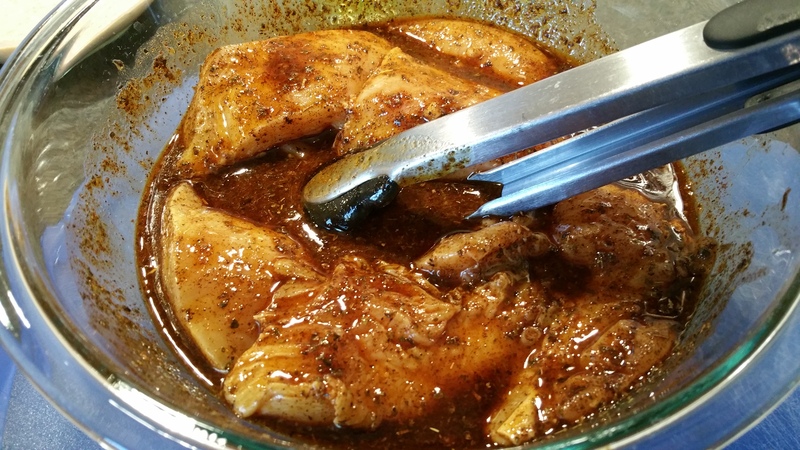 Mix the chicken marinade by combining all of the ingredients (orange juice through groud pepper) in a medium-sized bowl. 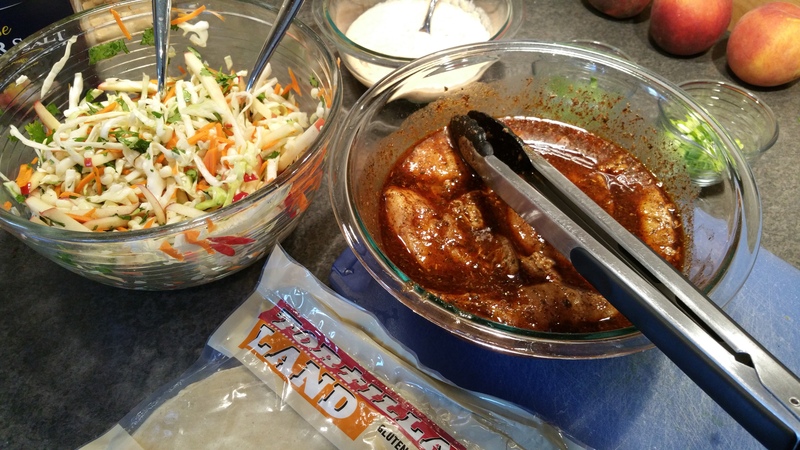 Cut the chicken breasts into tenders, and place them in the marinade. Allow them to marinate for about 30 minutes. Grill the two ears of corn. This is pretty simple. Preheat the grill on high, and put the ears of corn on the grill, husks and all. Rotate the cobs every 5 minutes, and the total grill time will be about 20 minutes. Remove the cobs from the grill, and let them sit for a few minutes before shucking the husks and silk and cutting off the kernels. Prep all of the ingredients as listed. 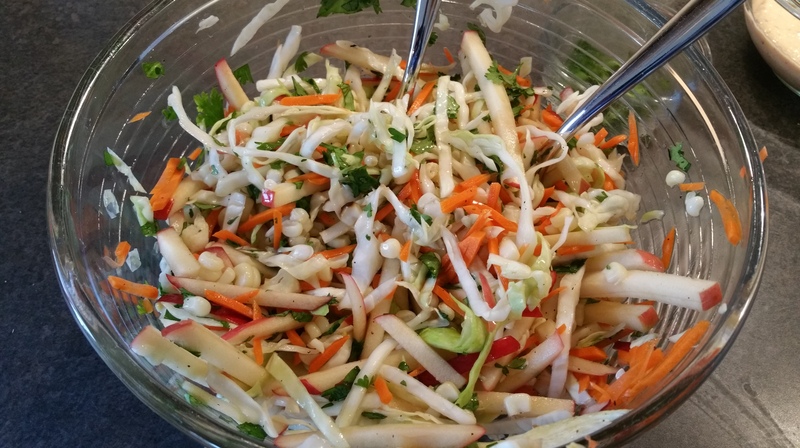 To make the slaw, combine the prepared ingredients in a large bowl, and toss to combine. To make the sour cream sauce, place the corn kernels (from one cob), the chipotle chile, honey, vinegar, salt and pepper in a food processor, and puree it until it’s relatively smooth. Fold the sour cream into the pureed corn mixture and add additional salt and pepper to taste. Grill the marinated chicken over medium-high heat. Depending on the size that you cut the tenders, your grill times will vary. I just tend to watch it closely, grilling the pieces for 3-4 minutes per side, and rotating them until they’re done all the way through. 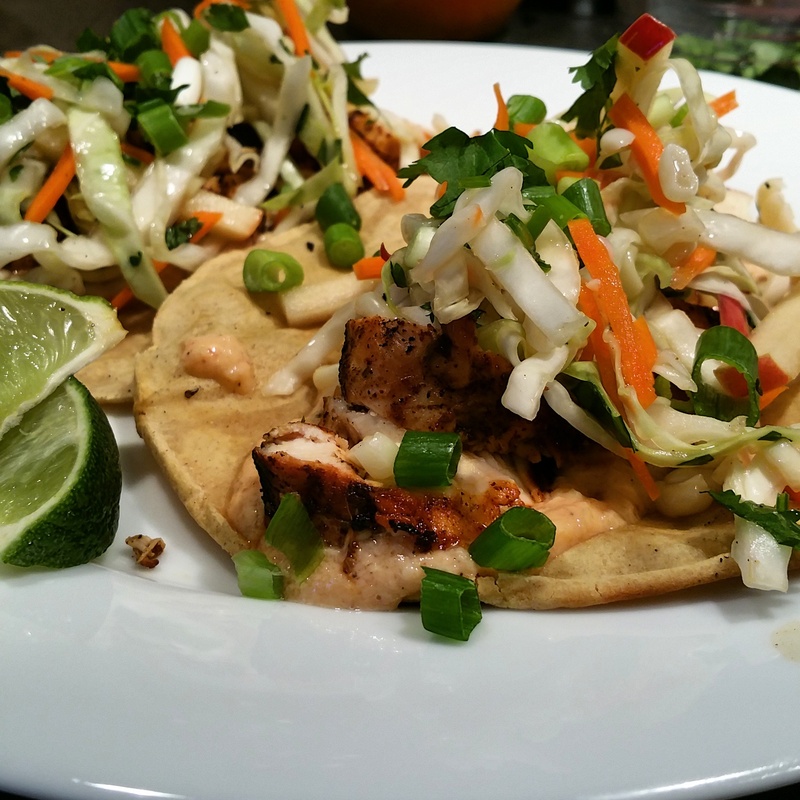 Assemble the tacos on a tortilla with a dollop of the cream sauce, a few pieces of the sliced chicken, a scoop of the slaw, a pinch of green onions and cilantro, and a squeeze of lime. how good are tacos?! And this slaw looks amazing.